Veloce ® cycling and bike rental company : Biking the great Po river, from Venice to Ferrara along the delta. Biking the great Po river, from Venice to Ferrara along the delta. I would like advice you this itinerary. 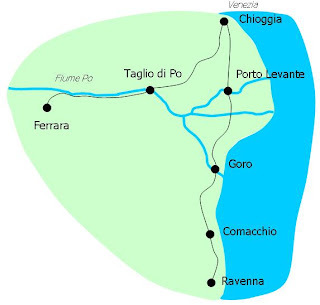 In this post you can download the road book and Map for ride by bike from Venice to Ferrara, along the exclusive Unesco World Heritage site delta's regional park of Po River. Please remember : our company can rent and deliver bikes at your hotel, airport or railway station in Venice and can pick up, for a small fee, at the end of your cycling holiday at your hotel or railway station in Ferrara.